When scholars first began to study the ancient Mayan culture, which flourished in Latin America during the first millennium, they were surprised to discover how highly developed Mayan knowledge of astronomy was. The Mayans were able to predict astronomical events such as eclipses with perfect accuracy far into the future. 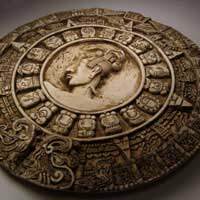 But something else struck the scholars too : for some reason the Mayan calendar came to an abrupt end on December 21 2012. What did this mean? Interpretations of the Mayan calendar and the significance of its end date vary significantly. Some insist it means nothing. The Mayans just picked that end date arbitrarily because their calendar had to end somewhere, they say. For others, though, the Mayan end date is a forecast of doom : life as we know it will end on that day. Either everyone will die, or something so tumultuously significant will happen, that our lives will never be the same again. The esoteric scholar Terence McKenna added another layer to the Mayan mystery when he published the result of his researches into the I Ching, an ancient Chinese book of prophecy. McKenna claimed that careful analysis of the I Ching revealed a pattern which paralleled events in human history. Mysteriously, it came to an abrupt end on December 21 2012. Rather than seeing in it a prediction of doom, however, McKenna tended to view the change positively. He believed that, on that date, a new era of enlightenment would begin. What would actually happen he was usually vague about, but some of his ideas included the invention of a time machine, the emergence of the first truly sentient artificial intelligence, or a global first contact event with an alien species. It's certainly fascinating that two separate ancient predictive systems, originating in completely distinct cultures, should both attach cosmic significance to the winter solstice event of 2012. Is it time to get scared? 2012 : Enlightenment or Doom? So if we are all doomed, what could the source of this doom possibly be? Some claim that the precessional cycle of the winter solstice will be in a once-in-every 26,000 years alignment with the galactic plane in 2012. In astrology, this precessional movement corresponds to a change in the precessional age : from the Age of Pisces to the Age of Aquarius, long foreseen as a time of enlightenment and joy. Some see in the alignment not joy, but danger, however. They fear that a great astronomical catastrophe is about to occur. Perhaps the black hole at the centre of our galaxy will send disruptive spurts of radiation hurtling towards earth, some say. Many speculate that the polarity of the Earth's magnetic field will be reversed, with possibly catastrophic consequences for all life on Earth. The Earth's magnetic field has, in fact, reversed polarity several times in the past, on average every 200,000 years. Moreover, a change is overdue. The last shift occurred almost 800,000 years ago. Scientists have also noted that the earth's magnetic field is fading. It is now 10% weaker than it was when first discovered in 1845. The fading may well be a precursor to a polarity shift. What the effects of a polarity shift would be are not completely known. Life has survived earlier changes but - as far as we know - nothing like a civilisation as advanced as ours. Astronomers point out, however, that the exact position of the galactic plane is not easy to calculate, and that a degree of imprecision is involved in making judgements about it. They say that the alignment could be more accurately described as occurring over a range of years rather than at one specific moment in time. Some even insist that the optimal alignment has already occurred - in 1999! So will the world as we know it end on 2012? Is doom just around the corner, or perhaps even universal enlightenment? Unlike many of the other great paranormal mysteries, this one has a definite answer. And we won't have to wait long to find out what it is.